A Diamond Select Toys release! Predators love the heat, and nothing beats the heat like a cool, refreshing drink. 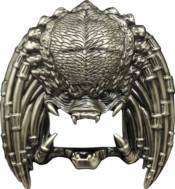 Whether you're slogging through an impenetrable jungle or hiding out in a Los Angeles barrio, use the mandibles on this metal Predator bottle opener to pop the cap off of your favorite bottled beverage. Plus, magnets on the back will hold it fast to your refrigerator or trophy case, so you'll never have to 'hunt' for an opener again! Packaged in a full-color slipcase.